The National Identity Management Agency [NIMC] has been engaged in expensive media razzmatazz and glitzy photo ops with top politicians and other prominent Nigerians in the past year. 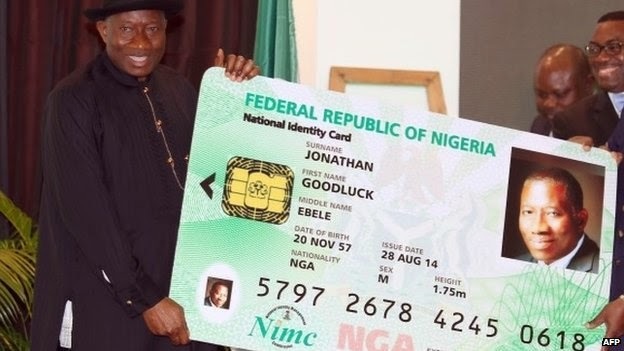 But these may just be a facade to hide the fact that the national identity card project currently lie in a legal limbo that may eventually cost the government as much as N44 billion of tax payers money in damages for an alleged breach of contract. The current legal logjam hovering over the project was occasioned by what the Managing Director of Chams Consortium Limited, Demola Aladekomo, described as an abuse of office and executive highhandedness by the Director General of NIMC, Chris Onyemenam. Chams, which was the initial concessionaires of the project, has therefore dragged NIMC to a Federal High Court in Abuja, seeking an order to stop further implementation of the programme. It is also asking the court to order the Federal Government to pay N44 billion in damages. In interviews with Premium Times, Mr. Aladekomo said his company was awarded the concession in a transparent bid process that involved 65 international companies in 2007, following the recommendations of a 2006 Presidential Implementation Committee, headed by the then Minister of Federal Capital Territory, Nasir El-Rufai, on how to deliver on a project that has gulped several billions but has remained largely in limbo for decades. Other notable members of the committee were the Minister of Finance, Ngozi Okonjo-Iweala, former Managing Director of Zenith Bank, Jim Ovia and Chairman of Heir Holdings, Tony Elumelu, Mr. Aladekomo said. He said trouble soon started after Mr. Onyemenam started dilly-dallying in getting the concession agreement ready. He said it took the NIMC chief executive three years to prepare the concession agreement. “Unfortunately for us, the DG NIMC just got a law degree a year before he was appointed,” Mr. Aladekomo told PREMIUM TIMES in his office in Lagos. He explained that in-between that time the company had invested upwards of N7.1 billion into setting up the facilities for the kick-off of the project. “Meanwhile, because we have promised the president that we were going to deliver in 2009 and he said ‘don’t wait for the concession agreement, start work’. We invested. We did an IPO, raised N8.4 billion, spent N7.1 billion on the project. One of the things we got out of the project was the Guinness World Record for the Chams City that we built. We built a switch that could handle 100 million Nigerians. We built a card plant that could produce 1.7 million cards a day in Abuja for national ID. We spent 7.1 billion of shareholders money preparing for the take off so that we can do consumer finance and credit bureaus, this man was busy writing concession agreement,” he explained. Mr. Aladekomo said by the time the concession agreement was ready for signing, Mr. Onyemenam had another surprise waiting for Chams. “By the time the concession agreement was ready we said let’s start he said. ‘No no no, I want to see all your designs, I want to see all your partners’. We gave him all our designs and showed him all our partners and had a big meeting in Abuja. We gave him our final design and showed him all our partners in 2012. “The day we showed him all our partners and gave him all our design that was the last day he spoke to us. The same night we introduced our partners to him in Abuja he went to all their rooms in the (Transcorp) Hilton that they should be dealing with him directly,” he said. When contacted Mr Onyemenam said he was not interested in engaging in media debate of the issue with Chams as it is a subject of an ongoing litigation. “As of today I am under advise to not speak on the concession which has been cancelled and over which Chams has gone to court and the next hearing has been fixed for sometime in June 2015,” he said in an email. The current controversy surrounding the project is not unprecedented. In fact, it is just another chapter in the troubled history of the Nigeria national identity card project. Since 1981 when the first contract was signed by the Shehu Shagari administration, the project has been a prime waster of taxpayers’ money. It is a financial black hole that consumes everything thrown at it without a trace. Like a compromised slot machine, it consumes but never regurgitates. From then to date, more than N121 billion has been spent on the project, meant to authenticate the true identity of every Nigerian, with nothing to show for it. An extensive review of government papers, contracts, court documents, newspaper articles and interviews with people who knowledgeable about the deals and agreements by Premium Times shows that the project has been repeatedly torpedoed by executive high-handedness, mind-boggling corruption, sheer irresponsibility of government officials and asinine abuse of power. But how come a project that would have been immensely beneficial to Nigerians as the national Identity card project ends up stymied every step of the way. The answer could be traced to its corruption-laden beginning. In 1976, former President Olusegun Obasanjo, then a military head of State, first conceptualised the national identity card project. However, the kick-off of the project didn’t happen until 1981 after Mr. Obasanjo had transferred power to a civilian elected government headed by Mr. Shagari. The project was rigged to fail from the beginning. According to a 2001 TELL magazine report, six companies originally bided for the project but the contract was awarded to Avant Incorporated, a company disqualified by a technical committee of the Ministry of Internal Affairs for its inability to provide a performance bond and its annual reports for three previous years. But the absurdity had only just begun. The project had a price tag of a $100 million, an amount too high for the government of the time to raise. So it ran to politically connected Arab-Jew, Nessim Goan, who brought in Optife of Switzerland, a company where he is major shareholder. While Avant handled the procurement and supply, another company owned by Mr. Goan, Afro-Continental, was to build the infrastructures across the country. By this calculation, Mr. Goan became the financier and the executor of the contract. The Shagari government also naively signed a loan repayment agreement that was not tied to the completion of the project. Though the contractors had 18 months to deliver the project, it became clear that Afro-Continental didn’t have the requisite know-how about identity card technology. Also not a single computer was even supplied. In a scramble for it to deliver on the project, which by this time was way past its deadline, Mr. Goan sublet the infrastructure phase of the contract to French technology heavyweight, Sagem. The arrival of Sagem marked another phase in the sordid history of the identity card project. Meanwhile Mr. Goan wasn’t done with Nigeria yet. Before Sagem could unpack its bags after it arrived the shores of Nigeria, the Shagari government was overthrown in a military coup. The identity card project was abruptly discontinued by the Muhammadu Buhari-led military junta. But after the Buhari regime was overthrown in 1985, the Ibrahim Babangida regime went back to doing business with Mr Goan. In fact, it ironically compensated Afro-Continental for not delivering on its earlier contract by awarding the company a new contract worth N70.7 million to refurbish containers for shipping goods to Nigeria, upgrade some of the computer supplied by Avant in 1982, install equipment as well as construct 20 computer centres across the country. This contract also fell through following alleged sharp practices between civil servants and officials of Afro-Continental. As if the old cow hasn’t been over milked already, in 1992, Afro-Continental was awarded another $73.4 million contract for the procurement of Automatic Finger Print Identification System (AFIS) and the re-activation of the computer centres across the country. Again, in 1998, the Abdulsalami Abubakar regime called for tender that would kick-start the national identity card project from scratch. This time, a consortium, led by a Nigerian company, Chams Limited, was awarded a $38.4 million contract to produce 52 million cards within four years. In April 1999, Chams delivered a pilot of 1 million cards. In 2001, as Chams was waiting for the government to fulfil its obligations such as the purchase of four personalisation machines as stipulated in the contract for the second phase of contract to begin, the Obasanjo administration called for the submission of tenders for the printing of a new 70 million identity card. The administration explained that it meant to harmonise the identity card project so it can be used for voters’ identification during the 2003 general elections and for the 2006 population census. But it soon became clear that the entire process was actually set up to hand the contract to one company – Sagem. According to the Mr. Aladekomo, the company immediately informed the Obasanjo administration of the subsisting contract it signed with the Abdulsalami regime to produce 51 million cards and the legal implications of continuing with the fresh call for tenders. But Mr. Obasanjo and other top ministry officials ignored several letters explaining the subsisting deal sent to them by Chams and went ahead with the fresh tenders. In fact, the counsel to the government, F.B.I Egolum, testified at a Justice Kayode Esho arbitration hearing on the matter that officials of the Internal Affairs Ministry recommended that Chams should either be allowed to completely execute the subsisting contract or handed an upgraded one. “At the end of the day, even the though the claimant [Chams] was recommended by officials of the Ministry for the award of the contract, the government in its wisdom decided to award it to someone else,” he said while answering questions during the arbitration hearing on why the deal was not awarded to Chams but to Sagem. In the statement of his ruling on the matter, Justice Esho said the Obasanjo administration acted with unprecedented irresponsibility. “The respondent [government] showed obvious legally indefensible irresponsibility on the part of a government which could not complain of lack of warning not of the knowledge of the legal consequences. “The respondent intended to and did commit a breach of the agreement. They went on a curious voyage of governmental legal recklessness, probably unprecedented in a government wishing to be guided by law. They deliberately jettisoned the contract, which they had with the claimant,” he explained. While ruling against the government, Justice Esho awarded total damages of $410,390.60 to Chams. The government appealed the arbitration judgment and the case dragged up to the Appeal Court before it eventually settled for an undisclosed negotiated settlement with the company. The Sagem contract turned out to be another fiasco. The company managed to print only 35 million cards. Along the line, three ministers – late Internal Affairs, Sunday Afolabi, his successor, Mohammed Shata, former Labour Minister Hussain Akwanga – were implicated in a $2 million bribery scandal and the company was eventually blacklisted by the government. In awarding the contract, Mr Obasanjo also ignored warning from Nigerian intelligence agencies that Sagem was too close to the French intelligence network and that there was no telling what it could do with the data gathered from the project. Sources familiar with the behind-the-scene deals leading to the award of the contract to Sagem told Premium Times that the French technology company had no business winning the contract in the first place. They claimed Sagem didn’t even make the initial shortlist from the bidding process. “Sixty-eight companies bided worldwide,” one of our sources said. “It was an international bidding in 2001 but it took about a year and two months before the bid could be analysed because some people tried to compromise the process. Eventually the first six companies were invited. The first company was Chams followed by MINT [Nigerian Minting and Printing Plc], then a Nigerian company and an American company. Sagem was the fifth company. The way tender was done in those days was that only the one to three is called, but they took it to six because Sagem was in number five. “At the end of the presentation to the exco, the companies retained their ranks but when the recommendation got to the president, some civil servants from internal affairs got Sagem to meet Obasanjo and said that the committee decision was wrong and that Sagem had made a lot of promises. “The French foreign minister flew in on a Thursday night, met the president Friday evening. The president called the 16 ministries involved, including INEC and the National Population Commission to a meeting on Saturday morning, Late Afolabi was there, Shata, his minster of State was there, late Guobadia of INEC was there, Akwanga was there. “The meeting held on Saturday 11 am, the president asked if anybody has taken money from Chams? They all said no that the process was transparent. The president said if nobody is confessing that they took money from Chams, he is going to give it to Sagem. That was how it was awarded to Sagem,” he added.